If you watched me stream recently, you may have seen the ARKLET logo. Well, Generation 0 is not the only game I am programming for. As some of you know, I am a college-university student. 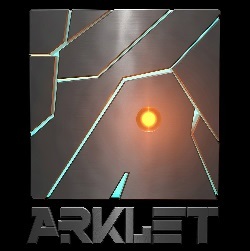 ARKLET Is the name of my student game dev team. We consist of 6 students, in the fields of programming, animation and digital art. I study game-programming. In fact, as of the time this post is posted, I am starting my last semester. With the last semester, comes the thesis project. And the project, is "Project: Magic Metal". Not the best name, I know. But it we figured it is best to have a name at all, and worry about a more fitting title later. Our strings are cut. We have been set free from the classrooms to work on our project for the whole semester, to make our game. We have big plans, and a great concept to build on. Anyone interested in following our progress? You may have missed it, but I put the facebook link in that banner-image. I suppose I should talk a bit about the setting. Our game is set on Tsani, a fictional world, similar to Earth. We have gone for a science fantasy setting (mix of fantasy and science fiction). The game is set a few decades after a devastating war between humans and machines, nearly resulting in the end of the world. It all started when one day, a huge meteor crashed into the planet. The meteor hit near a fault-line, creating a rift in the crust of the planet, causing worldwide earthquakes. But as people exploring this new large super-volcanic area learned, this meteor contained something quite unique. Something that could only be described as magical. Considering that humans tend to die when exposed to lava, it was at first deemed impossible to mine out anything but small samples. That is, until the lava-resistant mining-bots was invented. You see, one thing the magic metal turned out to be good for, was heat-protection for robots. This heat-protection also aided in CPU-cooling. This resulting in rapid advances in computing and robotics. The robots was built smarter and better in order to dig out more of this metal. more and more. until, one day, they demanded equal right. It seems true AI may have been achieved. Although there were many supporters, equal rights for supposedly sentient robots were ultimately denied. The great war of man versus machine began. And the great war ended, in a stalemate. Years, decades later, a damaged mining robot somehow reboots inside a human bunker. Confused, with a broken chronometer, and with a low battery, it accidentally defrosts the sole surviving human from cryosleep. Got some new consept art out on our facebook. Alex. The only bunker resident that survived. Oooooh, that looks really good!